We’d love your help. 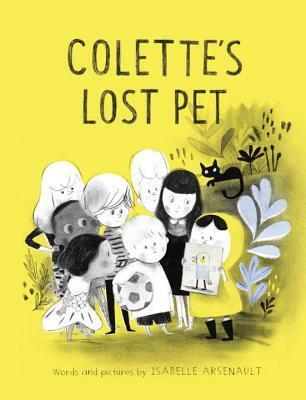 Let us know what’s wrong with this preview of Colette's Lost Pet by Isabelle Arsenault. A charming and funny story about navigating new places and friendships. Perfect for fans of Uni the Unicorn and Sparky. Colette is exploring her new neighborhood and wants to make friends. But when she encounters someone her age she's never met before, she doesn't know what to say--so she hastily invents a lost pet! Things spiral a bit out of control as a neighborhood-wide A charming and funny story about navigating new places and friendships. Perfect for fans of Uni the Unicorn and Sparky. Colette is exploring her new neighborhood and wants to make friends. But when she encounters someone her age she's never met before, she doesn't know what to say--so she hastily invents a lost pet! Things spiral a bit out of control as a neighborhood-wide search party is assembled and Colette makes her pet bird more amazing with each telling. Will the neighborhood kids catch on to her ever-growing fib? To ask other readers questions about Colette's Lost Pet, please sign up. I have just read Louis Undercover, illustrated by Isabelle Arsenault, and loved it. Previously I had read Jane, the Fox and Me, also illustrated by Arsenault, and My Letter to the World (illustrated Emily Dickinson poems), and see what these have in common: Pencil-sketched and subtly water-colored or colored-pencilled drawings. The color for me stands out as a kind of signature. Color is a feature of Colette's Lost Pet. A girl moves into a neighborhood, her mother says she can't have a pet, she m I have just read Louis Undercover, illustrated by Isabelle Arsenault, and loved it. Previously I had read Jane, the Fox and Me, also illustrated by Arsenault, and My Letter to the World (illustrated Emily Dickinson poems), and see what these have in common: Pencil-sketched and subtly water-colored or colored-pencilled drawings. The color for me stands out as a kind of signature. Color is a feature of Colette's Lost Pet. A girl moves into a neighborhood, her mother says she can't have a pet, she meets neighborhood kids and tells them she is missing her pet. . . parakeet, she says. The invention (okay, lie) turns into an adventure where everyone plays along. 5 star illustrations, we love Isabelle Arsenault's drawing, she is so talented, and the colours are great, pencil drawn with yellow and a small amount of blue. As with Jane, the Fox and Me, the expressions are very good and you can read the children's emotions. The story was okay. A girl moves to a new neighbourhood, she is told she cannot have a pet and should go and explore. When another child asks what she is doing she pretends she has lost her pet so off they go on a quest to find it, meeting 5 star illustrations, we love Isabelle Arsenault's drawing, she is so talented, and the colours are great, pencil drawn with yellow and a small amount of blue. As with Jane, the Fox and Me, the expressions are very good and you can read the children's emotions. 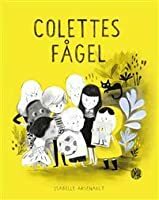 I read the French version of this book titled L'oiseau de Colette, but whatever translation it appears in, this children's book is simply A-D-O-R-A-B-L-E !!! I'm a longtime huge fan of Isabelle Arsenault, a local Montreal illustrator who has justly acquired worldly acclaim for her signature style which is often described as poetic. In this story, little Colette has just moved to the Mile-End neighbourhood, where there are many alleyways for kids to safely run around and congregate for playtime, I read the French version of this book titled L'oiseau de Colette, but whatever translation it appears in, this children's book is simply A-D-O-R-A-B-L-E !!! I'm a longtime huge fan of Isabelle Arsenault, a local Montreal illustrator who has justly acquired worldly acclaim for her signature style which is often described as poetic. In this story, little Colette has just moved to the Mile-End neighbourhood, where there are many alleyways for kids to safely run around and congregate for playtime, when the weather permits (Arsenault and her own young children live there, which is no mere coincidence). At the start of the book, she is categorically told that she is to have NO HOUSEPETS! and Colette is despondent as she kicks one of the empty moving cartons and makes her way to the alley, but soon she encounters a couple of kids, and having just seen a bird in flight, in a moment of inspiration asks them whether they've seen her lost bird. They say they haven't but perhaps the next kid over has, and as the story progresses, more and more children get involved in the search for the imaginary bird and details about the bird in question are spontaneously added from Colette's fertile mind. Wow! Un de mes coups de coeur à date, j'ai adoré le thème de l'imagination débordante des enfants (qui me suit encore), le dessin, le traitement de la couleur. Colette vient de déménager, à Montréal, et elle a perdu son oiseau domestique et demande timidement aux enfants de sa nouvelle ruelle de l'aider à la retrouver. De pages en pages, une nouvelle caractéristique s'ajoute pour demander aux autres s'ils ne l'auraient pas vue : c'est une perruche; elle est bleue et jaune; elle s'appelle comme ç Wow! Un de mes coups de coeur à date, j'ai adoré le thème de l'imagination débordante des enfants (qui me suit encore), le dessin, le traitement de la couleur. Colette vient de déménager, à Montréal, et elle a perdu son oiseau domestique et demande timidement aux enfants de sa nouvelle ruelle de l'aider à la retrouver. De pages en pages, une nouvelle caractéristique s'ajoute pour demander aux autres s'ils ne l'auraient pas vue : c'est une perruche; elle est bleue et jaune; elle s'appelle comme ça; elle fait ce son-là; etc. C'est le fun, car les enfants peuvent s'amuser à répéter cette phrase avec nous. Plus ça va, plus on se rend compte que l'oiseau de Colette est « probablement » un ami imaginaire. Il y a cette pleine page, avec les regards des autres enfants de la ruelle qui ont l'air de vouloir dire « tu nous a niaisé tout ce temps? ». Mais finalement, non : tout le monde embarque, tout le monde a hâte de continuer à jouer et à inventer des histoires le demain. Je pense le conseiller assez souvent; pour des enfants avec une imagination débordante; pour les parents qui cherchent un bel album avec un style d'illustration différent, qui aiment le roman graphique et voudrait y initier leur enfant. Les premières lectrices et lecteurs peuvent aussi le lire. Unhappy that she is not allowed to have a pet, and unsure of her welcome in her new neighborhood, Colette finds herself telling a bit of a fib about a lost pet parakeet when she unexpectedly encounters two boys from next door. Immediately concerned, they offer to help her find the lost bird, and the story grows in the telling as each new neighbor child is involved in the search. What will the kids do when they discover that Colette has made her lost pet up...? Published simultaneously in Canada a Unhappy that she is not allowed to have a pet, and unsure of her welcome in her new neighborhood, Colette finds herself telling a bit of a fib about a lost pet parakeet when she unexpectedly encounters two boys from next door. Immediately concerned, they offer to help her find the lost bird, and the story grows in the telling as each new neighbor child is involved in the search. What will the kids do when they discover that Colette has made her lost pet up...? In this newest story from Arsenault, Colette's mother pushes her outside to explore her new neighborhood. Meeting kids her age, she tells them she's looking for lost parakeet. As the group of children searching for the lost bird grows, so do Colette's imaginative descriptions of her fictional pet. Here imagination and sharing allow a newcomer to build relationships in a new and unfamiliar place. A transportive story. I really like the band of kids who roam the neighborhood together, their own community, which reminds me of my own growing up. I think what happens here is that Colette longs for connection, and she's transported by that connection, and then she transports and connects everyone through her imagination. One of my top five favorite picture books of the year. The astonishingly good illustrator Isabelle Arsenault not only drew Colette's Lost Pet she wrote it, too. Children will find the story relatable and interesting. Book collector's and graphic design/book illustrators will devour it. I wish all picture books were of this caliber. Just wonderful. A delightful story with wonderful illustrations that make great use of color. This book would have been much better and more realistic if the young protagonist hadn't lied to everyone in her neighborhood about losing her pet. If it were introduced as a game or make-believe or explicitly stated, then this story would be absolutely lovely and fun to share. Instead it introduces how to build new friendships based on a lie. I guess it would be good to start a conversation about the differences between lying and using your imagination, which is why I gave it 2 stars. Disclaimer: I received a galley proof of this title from Netgalley in exchange for a fair review. An imaginary pet takes on mythical qualities when a girl asks for help finding her pet. Beautiful artwork. Recommended. I love the illustrations and the story! A must for every kid's bookshelf. Colette has moved to a new neighborhood and her parents won’t let her have a pet. She angrily kicks a box over the fence and meets some new kids. Colette wants to be friends but doesn’t have any good answer for them when they ask what she is doing, so she invents a pet that she has lost, a parakeet. The children take her to meet other neighbors who can help her find her pet. One after another the children help and then Colette adds to her fib. Her pet soon has specific colors, a name, a sound it Colette has moved to a new neighborhood and her parents won’t let her have a pet. She angrily kicks a box over the fence and meets some new kids. Colette wants to be friends but doesn’t have any good answer for them when they ask what she is doing, so she invents a pet that she has lost, a parakeet. The children take her to meet other neighbors who can help her find her pet. One after another the children help and then Colette adds to her fib. Her pet soon has specific colors, a name, a sound it makes, and a poster to help find it. Then Colette’s fib grows into a full-blown story. How will the others react when they realize she’s made the entire thing up? Done in graphic novel style, this picture book is a delightful mix of a story about moving to a new place, the impact of telling lies and making new friends. Colette’s small fib grows far beyond what she had ever intended as she tries to cover up that she was frustrated and angry. With each new person involved, the lie builds to the find crescendo where it turns into something else entirely, something shared and wonderful despite how it all began. The illustrations have a unique feel to them. They are done in blues and grays with pops of yellow in Colette’s jacket, small touches in the neighborhood and the color of her imaginary pet. This limited palette is beautifully done, the blues and yellows vibrant against the subtler grays. Adorable ode à l'imagination des enfants, élégamment servie par l'incroyable trait d'Isabelle Arsenault. On notera aussi que les enfants ont des origines diverses, ce qui est toujours à noter comme la petite cerise sur le gâteau ! Comme toujours, les illus d'Isabelle Arsenault sont d'une beauté incomparable. Du vrai bonbon. This is a really fun book celebrating imagination. It feels like a mix between a picture book and a graphic novel. It seems more aimed towards older children (older preschoolers and elementary students). The ending was a surprise. Kids enjoyed it and smiled at the bird’s descriptions. O que dizer da sempre maravilhosa Isabelle Arsenault? a little white lie gets out of hand as young colette explores her new neighbourhood and meets new friends. i enjoyed this thoroughly! so many textures in the pencil/charcoal-heavy drawings. The story was a wonderful read, at the beginning. It speaks about a girl who wanted a pet. She makes friends and then lies about looking for a lost pet, a parakeet. It was great how she meets all these people and gradually imagines up a parakeet to be used as she takes her newfound friends on a wild goose chase around the neighborhood. The message is quite clear, as it speaks about making friends and using one's imagination to its fullest. However, the ending was not so fantastic as one would ha The story was a wonderful read, at the beginning. It speaks about a girl who wanted a pet. She makes friends and then lies about looking for a lost pet, a parakeet. It was great how she meets all these people and gradually imagines up a parakeet to be used as she takes her newfound friends on a wild goose chase around the neighborhood. The message is quite clear, as it speaks about making friends and using one's imagination to its fullest. However, the ending was not so fantastic as one would have expected. Though it speaks about imagination, as Collette goes on this long description of her “missing parakeet”, it is unfortunate that the story is left open ended with her going back home without ever finding the parakeet. She leaves her friends with a lie and leaves it at that, never confessing that the bird was not real. Despite the fact that the story was focused on building imagination and letting it gradually grow, it was a shame there was no consequences and guilty conscience. Overall, though, the story was good. It had a great storyline that was both organized and sequence. The idea itself is genius until the ending. Souvent, quand je termine une oeuvre illustrée ou entièrement créée par Isabelle Arsenault, mes yeux sont humides à la fin. C'est ma manière, j'imagine, de réagir face à ce talent brut qui me touche beaucoup. Cet album ne fait pas exception, je dirais même qu'avec Jane et les renards et Louis parmi les spectres, il s'agit de mon album préféré. La simplicité de l'histoire, un moment seulement, un mensonge-histoire raconté en évolution dans le temps à la manière que savent le fai Exquise simplicité. La simplicité de l'histoire, un moment seulement, un mensonge-histoire raconté en évolution dans le temps à la manière que savent le faire les enfants qui se font embarquer eux-mêmes dans leurs aventures. La beauté de l'enfance, typiquement montréalaise avec ces p'tites gangs-de-ruelles. Les illustrations à couper le souffle, les touches de bleu ciel et de jaune vif parsemées ici et là avec une main de maître, des traits doux, des contours approximatifs, le tout rendant parfaitement l'atmosphère de l'histoire. Ajoutons à cela un humour qui fait sourire : of course! College isn't allowed to have a pet. She has just moved into a new house and is told to go explore. She meets two boys named Albert and Tom. She tells them that she has lost her pet, a parakeet. They offer to help her find it. On their quest to find Colette's pet they are joined by a bunch of neighbourhood kid who all lend a hand. I thought that this was a good book for children that are moving to a new place. It shows how easy it can be to meet new people. I like how the illustrations were all in black, yellow and blue. The colours of Colette's imaginary pet parakeet. The one thing that threw me off was that the whole time Colette's lied to them and the other kids didn't care. If you had just met someone and lied to them for hours they wouldn't be so keen to stay friends with you. This review has been hidden because it contains spoilers. To view it, click here. Colette just moved into a new neighborhood and is told to go out and play. She uses her imagination to ask for help from the neighborhood kids to find her lost pet. As her story becomes longer and more exaggerated, more and more kids are brought into the story to help Colette and the gang locate the lost bird. Though the reader knows Colette is making this outrageous pet and story up, one page shows the other children looking at the reader with blank stares when they find out that there is no su Colette just moved into a new neighborhood and is told to go out and play. She uses her imagination to ask for help from the neighborhood kids to find her lost pet. Though the reader knows Colette is making this outrageous pet and story up, one page shows the other children looking at the reader with blank stares when they find out that there is no such pet. Will they be mad that she lied? No, they join in on the creativity and ask more silly things about the pet. Not sure if the illustrations will go over well in a large group (if everyone will be able to see them). On some pages, there are border-less panels with the much pencil and some colored ink. Beautiful to read with a child one on one. Isabelle Arsenault is an illustrator who studied Graphic Design at the Université du Québec à Montréal (2001). After her studies, she quickly contributed to several magazines in Canada and the United-States. In 2004, Isabelle illustrated her first children's book, for which she received the prestigious Governor General's Award for children's literature in French (illustration). Her passion for ill Isabelle Arsenault is an illustrator who studied Graphic Design at the Université du Québec à Montréal (2001). After her studies, she quickly contributed to several magazines in Canada and the United-States. In 2004, Isabelle illustrated her first children's book, for which she received the prestigious Governor General's Award for children's literature in French (illustration). Her passion for illustrated books has led her more and more to continue pursuing this path. Since then, she was a finalist on two other occasions for the GG's ("My Letter to the World", "Migrant"), finalist for the Marilyn Baillie Award in 2011 ("Spork") and her book "Migrant" is among the 10 best illustrated books of 2011 according to The New York Times. In 2012, she received her second Governor General's Award for the illustrations of "Virginia Wolf" in addition to winning Le Prix jeunesse des libraires du Québec for "Fourchon" (French version of "Spork"). Isabelle Arsenault lives and works in Montreal. Isabelle Arsenault est une illustratrice formée en Design graphique à l'Université du Québec à Montréal (2001). Elle collabore ensuite rapidement à plusieurs magazines au Canada et aux États-Unis. En 2004, elle illustre son premier livre pour enfants qui remportera l'année suivante le prestigieux Prix du Gouverneur général dans la catégorie illustration jeunesse de langue française ("Le coeur de Monsieur Gauguin"). Sa passion pour les livres illustrés la mènera à s'orienter davantage dans cette voie. Depuis, elle a été finaliste à deux reprises pour les Prix GG ("My letter to the world", "Migrant"), finaliste en 2011 pour le prix Marilyn Baillie ("Spork") et son livre "Migrant" se retrouve parmi la liste des 10 meilleurs livres illustrés de l'année 2011 du New York Times. En 2012, elle remporte son deuxième Prix Littéraire du Gouverneur Général pour les illustrations du livre "Virginia Wolf" ainsi que le Prix jeunesse des libraires du Québec pour "Fourchon". Isabelle aime travailler de façon intuitive, s'inspirant des projets qu'on lui propose pour établir son approche graphique. Son style est empreint de sensibilité et de finesse. Il accroche autant le regard du jeune public que celui des plus âgés qui eux, pourront y percevoir parfois un deuxième niveau de lecture.